The Indian Railways is one of the biggest government employers in India. According to the Railway Minister Mr. Piyush Goyal, the railways plan to recruit over 4 lakh people by the year 2021. Every year, RRB runs its recruitment drive to hire suitable candidates for various posts. Of all the advertised vacancies, the engineering field is the most prominent. Every year RRB recruits Junior Engineers (JE) by bringing out an official notification. As the RRB-JE posts come with attractive perks and facilities, millions of candidates apply for the posts, making it not an easy call to crack the RRB-JE exam. This year, RRB has introduced 13,487 vacancies for Railway Junior Engineer Recruitment 2018-19 Exam. It is going to be a highly competitive exam as lakhs of candidates are going to write RRB-JE 2019 tentatively in the month of April-May 2019. If you too have presented your candidature for RRB-JE exam then you have just a couple of months in your hands. So it’s high time now to pull up your socks, and start preparing for the RRB-JE exam. The RRB-JE exam includes two stages of Computer Based Tests (CBTs), followed by document verification, and finally medical examination. To be among the list of qualified candidates, applicants are required to score good in all the sections of 1st stage CBT and 2nd stage CBT. The candidates who clear the 1st stage CBT can only appear in the 2nd stage CBT. All the four sections of RRB-JE 1st stage exam are important and scoring, and should not be neglected by candidates at any cost. If all the sections are prepared well, a candidate can score decent marks, and proceed to the 2nd stage exam of RRB-JE. The preparation of all these four sections requires understanding the basic theory behind each topic, a little bit of common sense, and analytical skills. 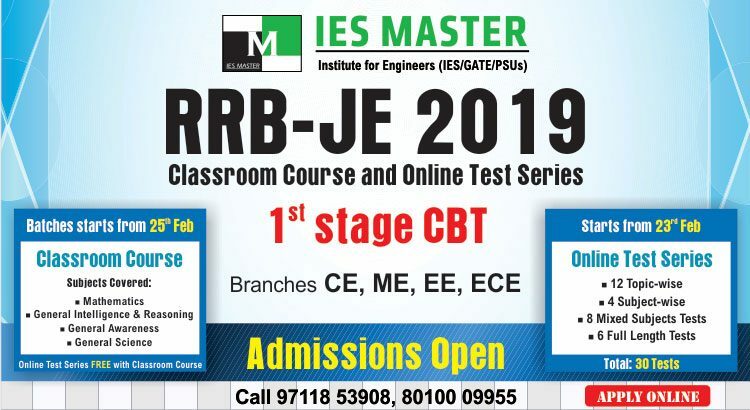 If you are an engineering student, and seriously looking forward to get recruited through RRB-JE 2019 recruitment drive then to help you achieve success in RRB-JE 2019, IES Master has come up with Classroom Course and Online Test Series for RRB-JE 2019 for the preparation of 1st Stage CBT. In this exclusively designed study program for the preparation of RRB-JE, IES Master has included classroom programs for all the subjects i.e. Mathematics, General Intelligence and Reasoning, General Awareness, and General Science. All the subjects will be taken by respective subject experts. To help RRB-JE aspirants determine their level of preparation, IES Master will be conducting an Online Test Series also which will include 30 tests. So what are you waiting for? 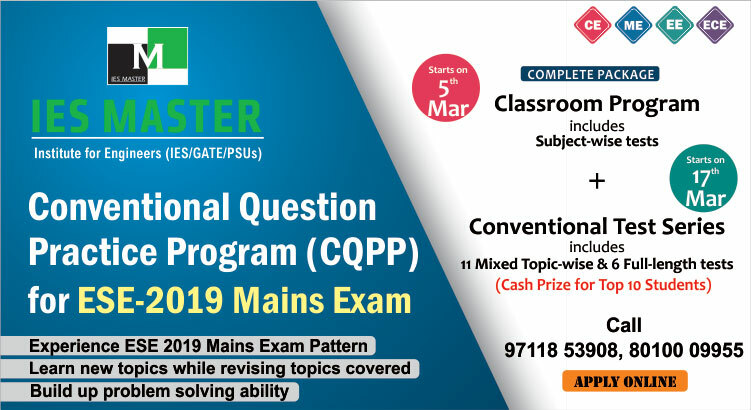 Be a part of IES Master RRB-JE Classroom Course and Online Test Series, and achieve success in RRB-JE 2019. If you have any queries or doubts, contact IES Master help desk at 8010009955, or drop a mail at info@iesmaster.org. Nice article. Very helpful for candidates.